DW’s daily European lifestyle magazine Euromaxx will be repackaged by CNCDP China for the Chinese market and other Mandarin-speaking audiences. According to a new coproduction agreement, CNCDP China will incorporate a local host and Mandarin voice-over to create a Mandarin version, with 78 hours of programming. Euromaxx is one of DW’s most popular shows in Asia and showcases the glitz and glamour of European fashion, design, food, culture, arts, architecture and music. CNCDP will have broadcast rights for all their channels as well as distribution rights to other broadcasters in China. This is not the first time that Euromaxx has been repackaged into another language in Asia. Last year, 26 episodes were coproduced with Xinya Media in Singapore for broadcast on their regional channel. Europe Zapovednik, DW's Russian-language, animated political satire, is resonating with Russian audiences and is one of the most viewed videos on DW's Russian partner website Ekho Moskvy. The 12-minute episodes tackle current political issues and put a funny and entertaining spin on important topics. For the grand finale of the 68th Berlinale film festival in Berlin on Saturday, DW's German-language programming on DW (Deutsch) and DW (Deutsch+) broadcast 24 hours of film specials and live reports. The Berlinale is one the world's most renowned film festivals, and culminates every year with a winning film receiving the "Golden Bear" award. Latin America DW will be opening a correspondents' office in Bogotá, Colombia in 2018. The new office will add to DW's reporting across Latin America. 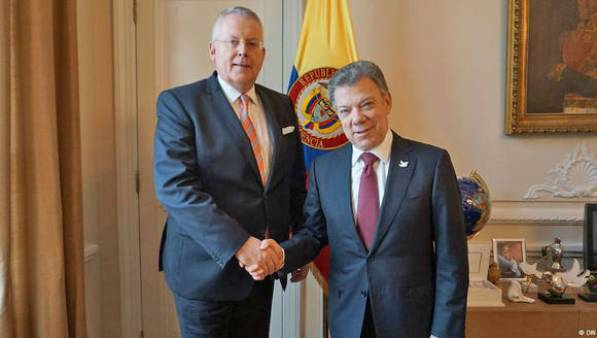 The plans were announced during a meeting between DW's Director General Peter Limbourg and Colombian President Juan Manuel Santos.